Title: "Return of the New Warriors?" 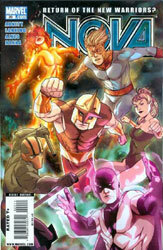 Some time ago...in the early days of the team, the New Warriors went into battle against a group of Terminus warriors. As they fought the metal monsters, the heroes debated whether they should call in the Avengers to help. Firestar and Marvel Boy wanted to bring the more experienced heroes for assistance. Speedball and Nova disagreed and wanted to prove to the world they can fight the big threats. Firestar and Marvel Boy saw their point and agreed. The Terminus threat was quickly eliminated by Speedball and Firestar. In the present, the New Warriors/Terminus battle is paused on television by Nova. He had been watching an archived video of the fight while he waits for his friends to arrive at the New Warriors' former Crashpad headquarters. The first to arrive is Vance Astrovik, the former Marvel Boy and currently known as Justice. He is followed quickly by Angelica Jones, the former Firestar who recently retired. Vance has brought beer and Angelica ordered a pizza. They soon realize they are the only three who are going to be at Rich's New Warriors reunion. Namorita and Night Thrasher are dead with Speedball's location unknown. The three friends toast the memory of their teammates and the former team itself. Angelica asks Rich how he was able to appear on their television sets to invite them to the Crashpad. Nova explains that it's one of the capabilities of the WorldMind. The former Firestar marvels at how Rich has matured into a cosmic level hero. The former New Warrior explains that he wanted to ask them if he had been a team player while he was in the group. Six slices of pizza later, Nova has explained the events of his life since the New Warriors up to the current situation with the WorldMind. Rich tells them that he didn't want to reform the Nova Corps too quickly and risked getting untrained recruits killed. He thought the WorldMind had understood his position only to recently discover that the artificial sentience has been creating Nova Centurions without Nova's knowledge or consent. Eight hours earlier, at Project: Pegasus, Nova and his brother Robert are arguing about his recent recruitment as a Centurion. Rich tries to explain that he is only worried about his sibling's safety but Robbie believes that his older brother is jealous. Nova tries to explain the dangers that come with being a member of the Nova Corps. However, the younger Rider only becomes more angry and storms off. Back in the present, Rich has finished telling his friends about his earlier confrontation with Robbie. The older Rider begins to wonder if he is jealous of his brother along with true concern about his safety. His former New Warriors teammates understand his worries but try to reassure him that the WorldMind wouldn't have selected Robert if he weren't ready for the powers. Angelica Jones asks her friend if it might be the rebuilding of the Nova Corps that's bothering him and the fact that the WorldMind did it without consulting him. Vance also points out that the wars Nova fought in might have gone better if there had been a Nova Corps to help in the fight. Richard Rider admits that he is scared of change. He has had the WorldMind to himself so long that he doesn't want to give it up. Meanwhile in Los Angeles, Centurion Qubit calls for the rest of the new Nova Corps as he heads into battle against the Dragon Man. Centurion Fraktur joins the fight and hits the giant android. However, Dragon Man responds by knocking Fraktur into the ground. Centurion Irani Rael comes up with a plan. She has Centurion Malik Tarcel and Centurion Morrow go in one direction with Qubit and herself going in the other. The four Centurions attempt to establish a four-point gravimetric net to contain the Dragon Man. The net doesn't work until Robert Rider arrives. Robbie explains that the plan was good but it needs adjustments. He sends revised calculations to the other Centurions' helmets and they try the net again. Centurion Rider has Morrow adjust his output by two points and the new net easily contains their foe. His fellow Novas express their respect for Robert's abilities as the younger Rider brother takes the contained android to the police. Back at the Crashpad, Rich tells Angelica and Vance that the new Nova Corps recruits are good people. He admits they are the type he himself would have selected for the new Corps. Suddenly, their conversation is interrupted by a team of security guards hired by the Taylor Foundation (the property owners) to protect the building. The three super-heroes become angry due to the guards' aggressive behavior and they decide to fight back. Thirty seconds later, the security force is running away in pure terror! Afterwards, the former New Warriors say their farewells and Rich agrees that they had been a great team. Suddenly, lightning begins flashing outside and Nova asks the WorldMind about the change in weather since storms hadn't been forecasted. Strangely, he gets no response from the artificial sentience. Richard Rider puts on his helmet and flies outside to check on the storm. 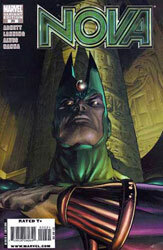 He is stunned to discover the storm is being caused by the newest Nova Corps recruit... Ego: The Living Planet!